My introduction to fly fishing began when I was in middle school shortly after dinosaurs no longer ruled the earth. A neighbor whose lawn I cut in the summer and whose drive I shoveled in winter gave me my first fly rod. The rod was a three piece sectional metal rod which I proudly kept in its fabric rod bag when not in use. I had an old clicker style reel and used monofilament line. My lures were garden hackle (worms). To the dry fly purist this would be an abomination but I presented my offerings along with a bobber to detect the strike. I read articles in outdoor magazines about fly fishing for trout and salmon while the specie of my pursuit remained panfish and bass. The seed was planted and as life progressed so did my interest. Like anything in life, fly fishing has its own specific terminology for rods, reels, lines, flies and even casts. Fly fishermen are rarely observed unless you happen to be floating down a trout stream or are watching a movie like, “A River Runs Through It”. Sometimes called, “The Quiet Sport” and shrouded in a type of mystique, the sport has been gaining in popularity for various reasons not the least of which is offering rehab for many people. This brief primer should provide the reader with enough information to begin to acquire the equipment necessary and embark upon an adventure that borders on addiction. Fly rods come in a variety of materials: cane, glass and graphite. There is nothing as beautiful as a cane rod crafted from bamboo; however, a quality cane rod comes with a price that could put a serious dent in the wallet. Fiberglass was the material used in the past and has since been replace with graphite. Graphite rods come in a wide range of prices starting around fifty dollars and going up to over eight hundred. The length may be from 7 ½ feet to over 10 feet and the weight also has a wide range. Weight does not refer to the physical weight of the rod but the weight of the line that the rod is made for. A rod that has the designation of 4 5 9 means that it is a rod that comes in 4 sections is made for a 5 weight line and is 9 feet long. Reels are devices on which the fisherman stores the line. To the novice a simple reel should prove sufficient unless you are going after steelhead or muskies (freshwater) or bonefish or tarpon (saltwater). Reels usually can handle a range of fly lines so it is important to make sure the reel can handle the line you intend to use. A person starting out will normally use the outfit in pursuit of panfish, bass, trout and pike and with that in mind I suggest a five or six weight outfit. 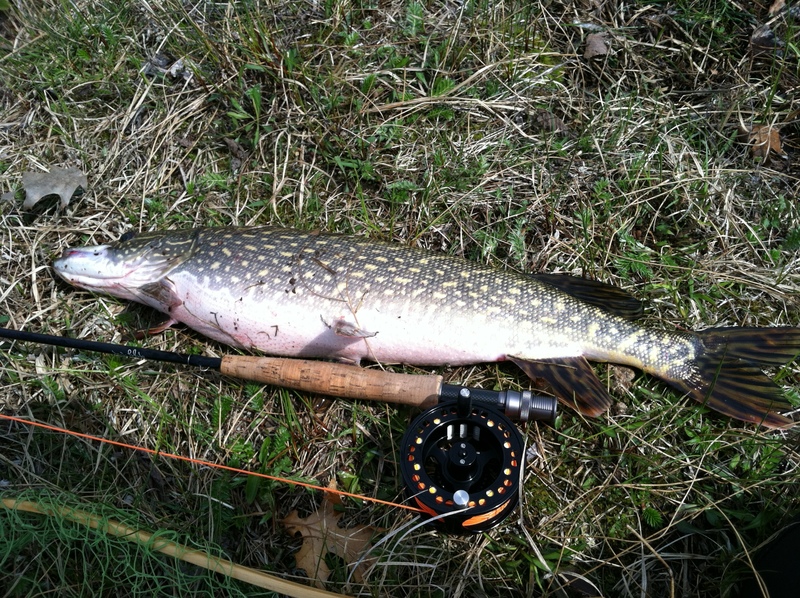 The next option on the reel is whether to choose a regular reel or one with a large arbor (spool for holding line) reel. The large arbor reel does a better job of preventing your fly line from coiling but the tradeoff can be weight. Fly line can be purchased for as little as twenty dollars to as much as one hundred dollars. This is an area where I recommend an investment in a good quality line. The description for line can seem to be almost a foreign language but it is not that difficult. Lines may be level, double taper, weight forward, floating or sinking. For the beginner I suggest a WFF (weight forward floating) line with a welded loop as it will make casting easier and the loop makes changing leaders easier. The next article will deal with flies and accessories so come back for that one. This entry was posted in fishing, Uncategorized and tagged bass fishing, fishing, fly fishing, life, lines, panfish, pike fishing, reels, rods, trout fishing. Bookmark the permalink.